Contractors & Architects Slate Roofing | Penn Big Bed Slate Co.
Roofing should be installed by experienced slate roofers. The contractor should furnish all materials and labor in accordance with the drawings and applicable specifications. The contractor should ensure that all surfaces were properly prepared for a slate roof installment and supply a guarantee on workmanship for a period of one year. 1. Roofing slate will be provided as ordered. It will be the standard thickness of approximately 3/16″ to 1/4″. The slate will be dense, hard, and sound rock. All corners should be practically full to ensure strength. The grain of the slate will run the length of the piece. The slate will either have been pre-punched with two holes or unpunched for installment with slate hooks. 2. Nails will be large head slater’s solid copper nails. Two for each slate. 3. Elastic cement or water shield should be an approved brand of waterproof substance colored to match nearly as possible to general color of the slate. 4. Slate does not need roofing felt to be laid water tight. Slate must be well ventilated to get it’s proper life expectancy. 5. Snow guards are necessary accessory to most slate roofs, but not all. 6. Use wood cant strip at eaves and in some cases at ridge and on hips depending on size of slate to be used. 7. Slates overlapping sheet metal work shall have the nails so placed as to avoid puncturing the sheet metal. Exposed nails shall be permissible only in top courses where unavoidable. 8. Neatly fit slate around all pipes, ventilators, and other vertical surfaces. 9. See local building codes before commencing slate application. 10. Natural slate, combined with a natural wood deck is a breathable roof that does not need any ice and water membrane when installed with traditional roofing techniques. 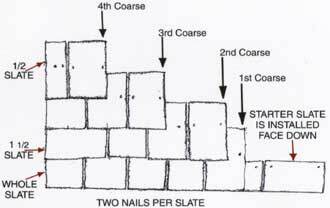 The slate shall project 2″ at the eaves and 1″ plus at the gable ends. 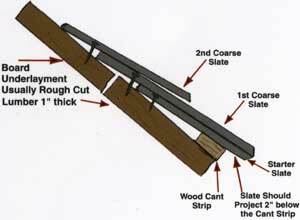 (Slates at eaves or at cornice lines shall be doubled and canted 1/4″ by using a wooden cant strip. The slates should over hang the fascia board by 1½” – 2″). In North America a 3″ lap is commonly recognized. However, for extremely low pitches of 25 degrees or less located in regions of medium to high precipitation a 4″ lap and large width slate is recommended. The exposure of any slate is easily calculated using this formula: length of slate : 2 – 1½ = exposure (length of slate divided by 2 minus 1½ equals exposure). E.g. 20″ length : 2 = 10 – 1½ = 8½ exposure. Starter Slate is installed face down but nail holes should be punched from the face side before placing slate on can strip. Start with whole slate, half slate, or one and one half slate depending on the roofers preference. Slate is hung. This means the nail should not stick up above the face of the slate, but you should not drive the nail to draw on the slate. Starter Slate and 1st coarse shouldproject 2″ below the cant strip at eaves. If you are not using Aluminum Facia or Vinyl Facia you may want to paint the cant strip before installing slate. 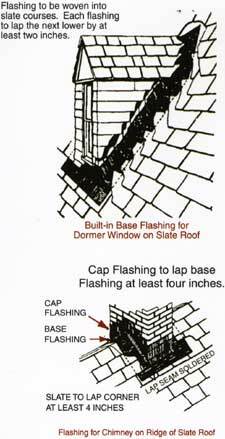 Ice and water shield is recommended at least from the eaves up to 24″ over the heated part of the structure. Also in valleys and on hips and caps. Silicone or similar roof cement should be used to cover nail heads on caps and in valleys. Slate felt is not necessary to make a slate roof water tight. Ice and watershield is not necessary either.